Halloween is a popular celebration in the USA, considered by many as the first of the winter holidays. Out of the many symbols associated with this feast, the most prominent one is the carved pumpkin, as it is the first thing that comes to mind when speaking about the event. 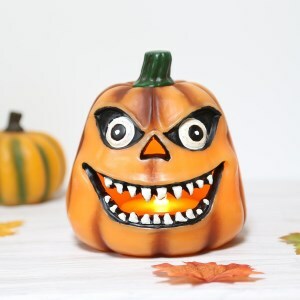 To show you some of the most interesting and coolest Halloween-themed decorations currently available for sale, we have written a list of product reviews that present some of these items, which you can place around or inside your house when the day approaches. Pumpkin lanterns are some of the top children’s favorites when it comes to Halloween decorations. These are made out of semi-transparent paper, with various symbols printed on it. This product, designed by Halloeen, is available with four different prints depicting a pumpkin, a spider web, bats or skeletons. Made out of paper, plastic and iron wires, the lanterns are battery operated and lit by a safe LED bulb. They are foldable, so storing them is not a problem, and can be hung pretty much anywhere as they are lightweight. The lights are not too bright, nor too dim, so they offer a nice glow, perfect for decoration and with low power consumption. 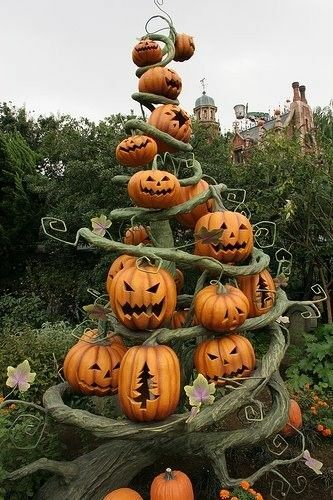 Another cool decoration is the Jack O Lantern, with a pumpkin design. The design, manufactured by HANPURE, is more realistic and offers an accurate simulation of candlelight. This is another customers’ favorite, thanks to its features. Made out of most of the wax, it has a lifelike design to which the light bulb, built to mimic the effects of real candles, contributes greatly. Powered by batteries and with an adjustable timer function, they are safe to operate, by eliminating the dangers of a real open flame. It is also energy saving, enabling you to enjoy the product for longer hours. It can be placed wherever you want, and it is also pet-friendly. Outdoor decorations come in many forms, but this is a really innovative one – it is lit and inflatable, and it creates a funny and pleasant atmosphere. The product is manufactured by Joiedomi. 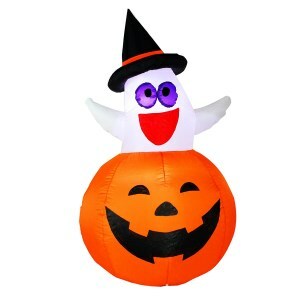 The 4.5 feet tall decoration depicts a ghost with a witch hat, sitting on a pumpkin. The cute design was appreciated by many customers who wanted an alternative to the spookier prints commonly available. Bright LED light bulbs are incorporated, lighting the decoration up during the night, attracting everybody to your home. It is easy to use, coming with a long power cord, stakes, and fastening ropes; it is also power efficient, and, even though it must be plugged into work, you will not feel it on your next bill. 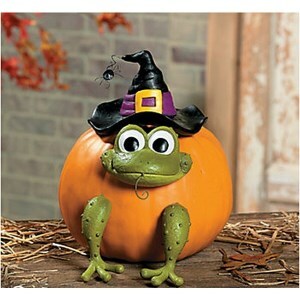 Another common Halloween-themed decoration is the frog; with this ornament, it comes together with the most popular of all symbols, the pumpkin. The decoration is popular due to its lower price and ease of use. The frog wears a witch hat, and it has to be put together by the user, who can put it on a carved pumpkin with the metal nail spikes placed on the legs and head. The resulted decoration can be placed wherever you want, but it is not lit and will not glow in the dark. However, assembling it is a great creative activity for your children, who will get together to build the ornament. Babies can now also enjoy a Halloween play set, thanks to this toy designed by Genius Baby Toys. The set includes a pumpkin, a ghost, a candy corn, a spider and a cat, all made for toddlers to enjoy. All the items included in this set are big enough to prevent accidental swallowing and are made out of soft textile materials recommended for babies. 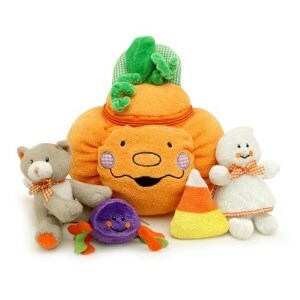 They all make sounds (except for the big pumpkin) – the cat meows, the spider rattles, the ghost squeaks and the candy corn crinkles, making the toy interesting and more attractive towards young children. These products have been certified and are safe to use, implying that one must not keep a permanent eye on the baby playing with these toys. Light ornaments are very popular, and this item is no exception. The decoration is appreciated for its ingenuity and ease of use and installation, as well as versatility. This item is similar to the usual Christmas lights, in that there are several bubble lights on the same wire that can be stretched wherever you want. The set is composed of 7 3”x5 bulbs placed on 3”x2” pumpkins. It has clips that allow you to easily install them wherever you want, as well as connectors at both ends to allow linking it with other light sets. They are weatherproof too, so using them as a garden decoration will not cause them any harm or damage. 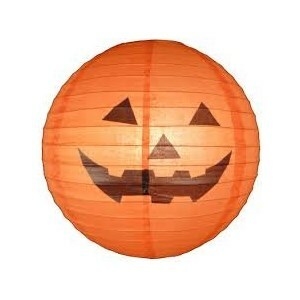 Pumpkin lanterns can be bought as dedicated items or, by using a cover shade, you can turn pretty much any source of light you find in your home into one. Special cover shades are manufactured for this occasion. The Lamplighter lamppost cover shade can be used both outdoors and indoors. It is made out of polystyrene and rubber, helping it resist against wind, cold or rain, as well as making it UV-resistant so that the colors will last longer in time. 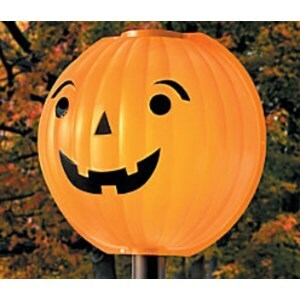 It can be fitted over any electric lamppost or bulb that has a maximum 3 and 1/4” diameter, instantly turning it into a Halloween-themed decoration. 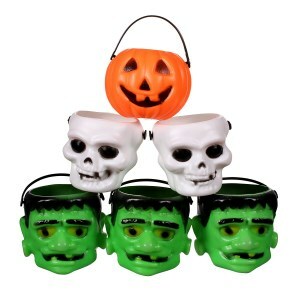 Candy holders can be used as Halloween decorations, and this product is designed for this purpose. The 12 pieces set includes 4 pumpkin-like bowls, 4 Frankensteins, and 4 skulls to be used as eerie accessories for a themed party. The cups are small and can be placed anywhere thanks to their reduced dimensions. Since they all cost only $10, you can give them to your guests as a souvenir after the party is done. Pretty much anything can be placed inside them – pretzels, nuts, chocolates and candies – and since there are 12 holders in each set, they can be placed around the house for easy access. 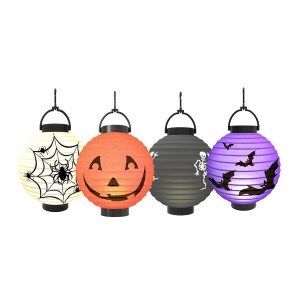 This set of lanterns is everything you need for decorating your home or garden with many different colors and themes. They have different prints and can be used outdoors or inside, depending on what you require. Made out of paper, they are easily foldable and can be stored without difficulty. The set contains 3 bat prints, in purple, 3 pumpkins in orange and 3 white spider web designs. It does not include the lights, so you will need to purchase the candles or LED bulbs if you do not want to light up candles. The diameter of each sphere is about 10 inches, so they are not too big but are large enough to be easily spotted. If you want to make your own decorations, you can purchase this kit that can be used to obtain 12 ornaments, by adding the foam decorations craft on real pumpkins. Easy and fun to use, it enables you to obtain many creative designs. The multicolor sheets allow you to obtain different designs, and applying them to the real vegetable can be a pleasant family activity involving your children. The obtained decoration can be also carved, to put a candle in it, and can be placed wherever you want. The pack contains 12 different sheets, and their design might vary between different items. The Halloween season is an occasion to experience joy and excitement because people have the opportunity to search for all sorts of bizarre items that are scary and spooky. It’s not an easy task to find cool Halloween pumpkins because there are many shapes and sizes and not all of them can be easily carved. You must pay a great deal of attention to the pumpkin’s texture and color, aside from the size. Especially if you plan on throwing a party with lots of guests, you probably need several Halloween pumpkins that can be shaped into jack-o’-lantern’s that you can be scattered inside the house or in the backyard. But most people don’t know or lack time to choose suitable pumpkins; therefore, some guidelines can come in handy. If you’re one of such individuals who are feeling a tad baffled, you’ll most likely appreciate these useful tips coming from experts that have already been there and know the situation you are confronted with. Don’t worry because you too can become a spooky pumpkin expert if you decide to take a look at this buying guide that shows you what features are mandatory for carving the best pumpkin specimen. There are many options when it comes to carving awesome jack-o’-lantern pumpkins for Halloween. If you need a serious amount of fear, then take a quick look over these features we’ve showcased below. This way, pumpkins won’t stand a chance with you, and you’ll never have a problem with future Halloween holidays. A moment of true terror, Halloween is a holiday adored by children and adults because it is the only time of the year when they get to hide their faces and pretend to be a character they like. Besides the costume frenzy, there’s the need of finding the best Halloween pumpkins which are mandatory for any respectable and spooky party. Generally, pumpkins come in many shapes, colors, and sizes, and the choice is not easy to make especially if you plan on carving yourself. You’ll notice that pumpkins can be found in yellow, green, and even a white shade. The most common option is yellow because it looks scarier if you light up the candle inside at night time. There are people that don’t enjoy carved pumpkins and opt for regular ones, that can be found for sale in every market or grocery. 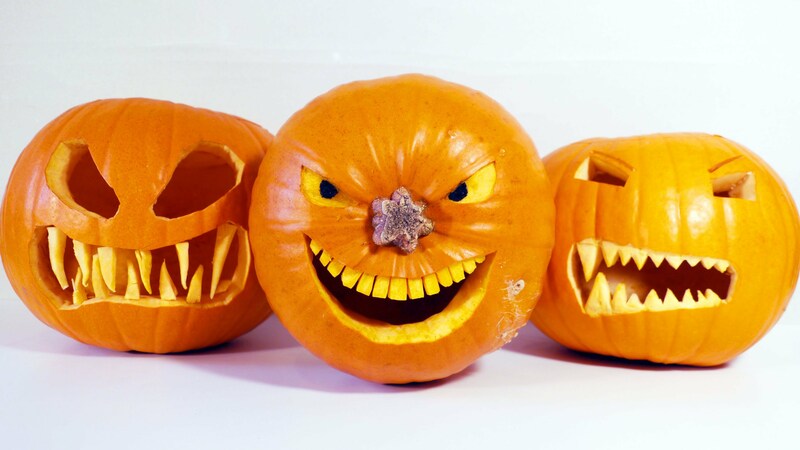 But there are holiday enthusiasts that want to make a statement out of their pumpkin and use all sorts of tools and accessories for creating scary faces. Basically, if you need pumpkins for the sole purpose of decorations, you can place some of them inside your house or on your door steps and light candles around them. If, however, you really want to show off your design skills you should probably opt for creative Halloween pumpkins. In this case, you’ll need to acquire pumpkins that have no visible bruising or irregular spots. Plus, check to see if they are smooth and uniform because you’ll have to put them on a surface in order to carve. Their texture should be soft but durable in order to last several days after using the knife. Just make sure you handle them properly and don’t grab them by the stem because there is a risk to break it or even worse, drop the pumpkin. Carving pumpkins is an activity that requires time and some level of creativity. If you lack both of them then you don’t necessarily have to carve them. You can decorate the rest of the house and use markers to draw scary faces on the front of the pumpkin. According to your desires, you can create cute Halloween pumpkins out of paper or real ones that won’t scare the children away. This option works best especially if you have small children in your family and want to make sure they truly enjoy this holiday and get used to the spooky spirit. Remember the times when you were a kid, and you waited for Halloween all year long? And the number of sweets you got from family friends and neighbors? Well, it is a known fact that children are prone to events that require disguise costumes and candy, therefore, you should get them involved in the mission of finding and carving the perfect Halloween pumpkin. Give them specific tasks and allow their creativity to flow. Play with ideas and see which of you is able to draw the scariest pumpkin ever. This way, you get some cool decorations for the house but also spend time with them, having tons of fun. Just be careful if you plan on carving pumpkins because knives are dangerous, so don’t let the small ones handle them. Give them paper and crayons instead and ask them to draw as scarily and spooky as possible. Without too much effort, you’ll have the coolest Halloween pumpkins to brag about. 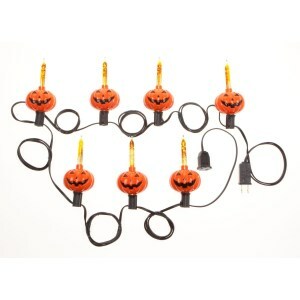 Halloween pumpkins can be used for decorating the house, the garden or just as regular party accessories. No matter their purpose, they should have a smooth surface and no discolorations because you intend to put candles inside or around them and eventual flaws don’t look good at all. If you plan to purchase more than one pumpkin, you should try to get the same size and color. 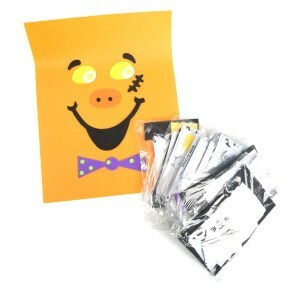 Especially if you need them for decorating an entire room or for school Halloween parties. Small and medium pumpkins are preferred for carving because they don’t take much time, and it’s less messy. Pumpkins are placed on the floor, grass, stairs or tables. Wax candles can stain so be careful to put something underneath the pumpkin if you place it on a table top. There’s no need to draw faces on pumpkins if you just want to make small decorations because uncarved ones last longer and look nice in the kitchen or on your terrace.